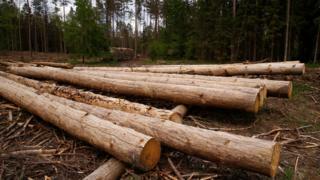 The EU executive has urged Poland to halt logging immediately in one of Europe's last remaining areas of primeval forest, and has asked the European Court of Justice to act on it. Last year the Polish government decided to increase logging in Bialowieza Forest, a unique ancient habitat and conservation area, three-fold. Unesco, EU officials and green activists protested at that move. The government says the logging can help to curb a bark beetle infestation. But the European Commission says some endangered species are at risk. The forest, a Unesco World Heritage site, lies on Poland's eastern border with Belarus. It is famous as a home for rare European bison, but also boasts many bird species including varieties of woodpecker and flycatcher. The Commission's move comes a day after Poland's government drew strong criticism from EU officials and human rights campaigners over a new law on appointing judges. Parliament, instead of judges themselves, will have the power to select 15 of the 25 judges on the National Council of the Judiciary (KRS), whose role is to guarantee judicial independence. Critics see it as a politicisation of the justice system, undermining the separation of powers. "Major setback for judicial independence," tweeted Nils Muiznieks, a senior official at the Council of Europe, the top European human rights watchdog. The head of the liberal (ALDE) group in the European Parliament, Guy Verhofstadt, wrote on Facebook that "there is no independent and impartial judiciary in Poland anymore - a situation clearly incompatible with EU treaties". In an earlier move, Poland's conservative Law and Justice (PiS) government also revamped the Constitutional Tribunal, Poland's highest court. Critics said the reform would make it harder for the tribunal to block PiS policies. The EU Commission took the unusual step of asking the court to impose an immediate ban on the logging because it takes on average two years to reach a judgment in cases like these, and the EU is worried the logging is already causing irreparable damage. The EU's top court may decide to impose the ban before it breaks for summer recess on 21 July. If it eventually rules that Poland has infringed EU environmental regulations, it can impose hefty fines on Warsaw. However, this case only refers to a single area in the forest, and Poland's environment ministry could decide to increase logging in two other forest districts. Poland's PiS government has refused to back down in other disputes with Brussels. The Commission is investigating whether the government committed a serious breach of the rule of law in its handling of the Constitutional Tribunal.